Here is another unused design (due to time) for Edward D Edwards. Here he is as Dracula. 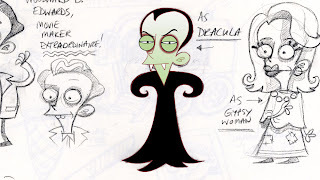 You can see Curtis Joblings design pencil sketches and the finished Flash model put over the top. On the right is the Gypsy Woman design that was used in the episode.